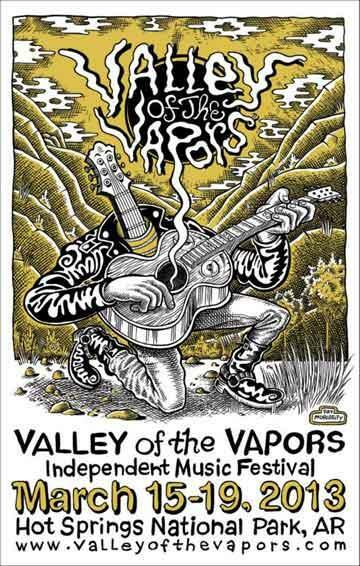 The 9th Annual Valley of the Vapors (VOV) starts in less than a week. From March 15 – 19, Hot Springs will be filled with the sound of music from over 40 acts such as Funeral Suits, PeeLander-Z and Jamaican Queens. Secret shows start at 6pm each night, and the location is…a secret! 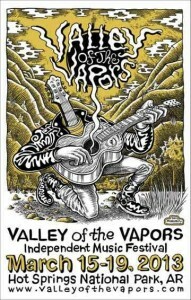 Venues will be announced each day on the VOV Facebook page and Twitter. Artists performing at these free shows are Psychic Twin, Idiot Glee, The Black Atlantic, and Pujol. The main events will be held each night at 7pm at the Low Key Arts Building at 118 Arbor St., just off Central Ave. These intimate performances will feature 5-7 bands each night. Admission to these shows is $7 per person, or you can purchase VOV Festival Passes for $40.